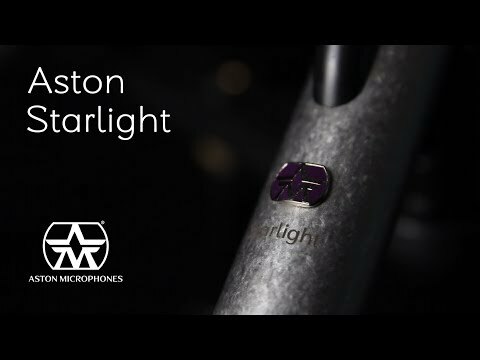 The Aston Starlight Small Diaphragm Condenser Microphone is the worlds first laser-targeted pencil mic. With incredible acoustic pickup capabilities and indestructible build quality it's little wonder that it was hand-picked by a panel of more than 50 top producers in double blind listening tests conducted during 2016. The technology in the Starlight is a step or 2 further than any other mic in its class. The painstakingly tested thicknesses of the sintered head combined with the sinter spheres and nickel plate delivers near perfect acoustic porosity. In addition the head is virtually indestructible, so no matter how much travel the Starlight endures it will perform as if it was fresh out of the box. The Starlight has the advantage of a Class 2 laser with on/off switch. This allows the user to recall mic positions in the studio so set up can be easily replicated, ideal for long recording projects. It also means, for touring bands, that mic positions can be marked off on drums so when you come to set up at your next gig, you can position the starlight, hit your pre-saved automation setting on the desk and you're done! The Aston Starlight comes with voice switching offering you Vintage, Modern and Hybrid modes to get the perfect tone response for your application… guitar cab, drums, strings and vocals. Whatever you need the Starlight for it certainly punches well above its weight at this price point. Complete with Eco friendly packaging, the Aston Starlight Small Diaphragm Condenser Microphone offers the absolute premium in technology so that you get the best sound possible with absolute accuracy.